Toronto, Ont. 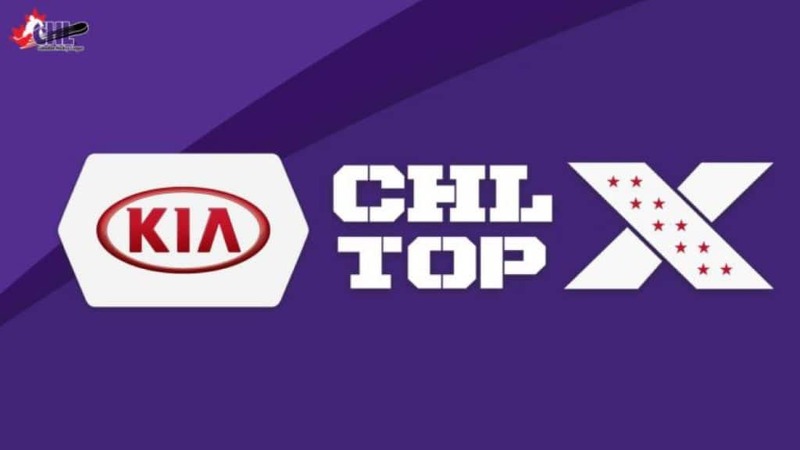 – The Canadian Hockey League today announced the week twenty-two edition of the Kia CHL Top-10 Rankings for the 2018-19 season. The weekly rankings of the CHL’s Top-10 teams are selected by a panel of National Hockey League scouts. Still leading the Western Hockey League, the Prince Albert Raiders claimed second spot in this week’s rankings with wins against the Swift Current Broncos and Moose Jaw Warriors and a pair of losses to the Brandon Wheat Kings. With Monday’s 4-3 win against the Warriors, the Raiders surpassed the 1972-73 Saskatoon Blades for the second-most victories in a 68-game season with 47. With 10 games remaining in their season, the Raiders are on pace to surpass the 1971-72 Calgary Centennials, who hold the WHL record with 49 victories in 68 games. The Raiders will continue their pursuit of the Scotty Munro Memorial Trophy Friday, February 22 (7:00 p.m. CT) as they play host to the Kootenay ICE. Ranked in the seven spot for another week, the Everett Silvertips went 3-1-0-1 on a five-game stretch this past week. Their week started Thursday with a shootout loss to the Red Deer Rebels, but rebounded with a 3-1 win against the Kelowna Rockets Friday. After the Silvertips took a 4-1 loss to the Seattle Thunderbirds Saturday, they bounced back again with a pair of 4-1 wins against the Prince George Cougars. The Silvertips improved to 3-0-0-0 this season against the Cougars, outscoring them 14-3 in the process. Beginning a four-game home stand, the Silvertips will play host to the Seattle Thunderbirds Friday, February 22 (7:35 p.m. PT). Finding their way into the Kia CHL Top 10 Rankings this week were the Saskatoon Blades, who haven’t lost in regulation since January 12, rattling off a 11-0-2-0 run in their past 13 games. Goaltender Nolan Maier has been a big part of the team’s rise since the start of the calendar year, posting a 12-1-2-0 record, 2.33 goals-against-average, and a 0.918 save percentage. That has him tied for the most wins in the league during that span. On the cusp of clinching a spot in the 2019 WHL Playoffs, the Blades will make their final trip of the regular season to Manitoba, taking on the Brandon Wheat Kings Friday, February 22 (7:30 p.m. CT). 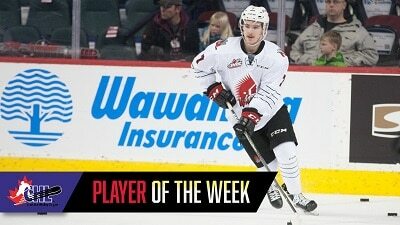 Earning honourable mentions this week were the Vancouver Giants and Portland Winterhawks. Having already secured a spot in the 2019 WHL Playoff, the Giants continue to lead the B.C. Division, closing in on their first division crown since the 2009-10 season. The Giants can get closer to that goal Friday, February 22 (7:30 p.m. PT) when they host the Victoria Royals at the Langley Events Centre. The Portland Winterhawks booked their spot in the 2019 WHL Playoffs Sunday with a 5-2 win against the Thunderbirds. Saturday, Joel Hofer (St. Louis Blues) recorded the fourth shutout of his WHL career, 2-0 against the Red Deer Rebels, en route to capturing WHL Eli Wilson Goaltending Goaltender of the Week and Vaughn CHL Goaltender of the Week honours. Wins Sunday and Monday against the Thunderbirds and Giants respectively were aided by back-to-back hat tricks from WHL leading scorer Joachim Blichfeld (San Jose Sharks), who became the first player in the WHL and CHL to reach 100 points this season. The Winterhawks are on the road Friday, February 22 (7:05 p.m. PT), closing out their season series against the Tri-City Americans. Calgary, Alta. 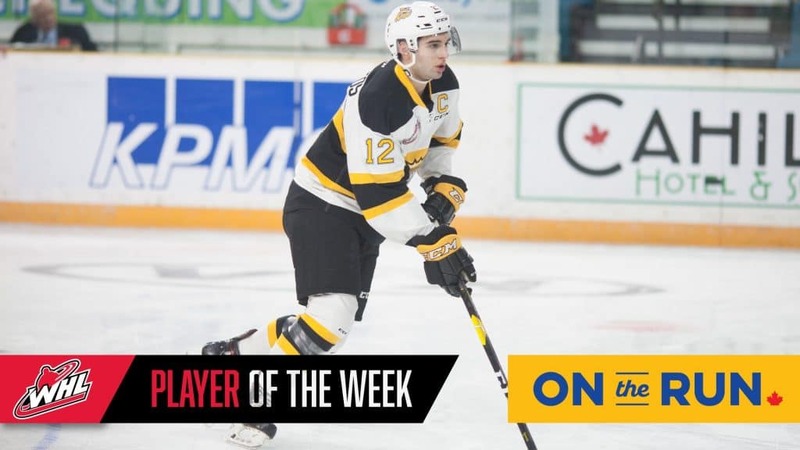 – The Western Hockey League announced today that Carolina Hurricanes prospect and Brandon Wheat Kings captain Stelio Mattheos has been named the WHL On the Run Player of the Week for the week ending February 17, 2019. Mattheos recorded nine points (4G-5A) and a plus-seven rating in three games as the Wheat Kings won three-straight games against division-leading clubs, taking down the Edmonton Oil Kings and sweeping a home-and-home series against the Prince Albert Raiders. The wins improved the Wheat Kings’ record to 6-3-0-1 in their past 10 games, placing them four points behind the Red Deer Rebels for the final wild card spot in the Eastern Conference. At home Wednesday, Mattheos recorded a goal and two assists in a 5-2 win against the Oil Kings. He scored Brandon’s fourth goal, also picking up assists on the team’s third and fifth goals to earn first-star honours in the contest. Friday in Prince Albert, Mattheos recorded a pair of primary even-strength assists in a 5-4 overtime win. Mattheos’ first assist came on the team’s second goal while his next helper came in third period as part of the game-tying goal to force overtime. Mattheos saved his best performance for last, recording a hat trick and four points Saturday in a 6-3 win at home against the Raiders. Mattheos scored the second, third, and fifth goals of the game for Brandon, adding a primary even-strength assist on the team’s first goal. His efforts earned him first-star honours for the game and the second star of the night in the WHL. Overall, Mattheos recorded seven points (3G-4A) at even strength with a goal and an assist coming on the power play. Mattheos was selected by the Hurricanes in the third round, 73rdoverall, at the 2017 NHL Draft. Through 52 games this season, he leads the Wheat Kings and ranks fourth in WHL scoring with 82 points (37G-45A), including 18 power-play goals, and four game-winning goals. At the 2014 WHL Bantam Draft, the Wheat Kings selected the 6-foot-1, 200-pound Mattheos first overall. In 240 WHL regular season games, the 19-year-old Winnipeg, Man. product has recorded 264 points (120G-144A), including 50 power-play goals, four short-handed goals, and 18 game-winning goals. He’s also appeared in 45 WHL Playoff games, recording 25 points (12G-13A), including one power-play goal and one game-winning goal. The Wheat Kings continue a four-game homestand Monday, February 18 (2:30 p.m. CT) when they play host to the Swift Current Broncos at Westoba Place. Calgary, Alta. 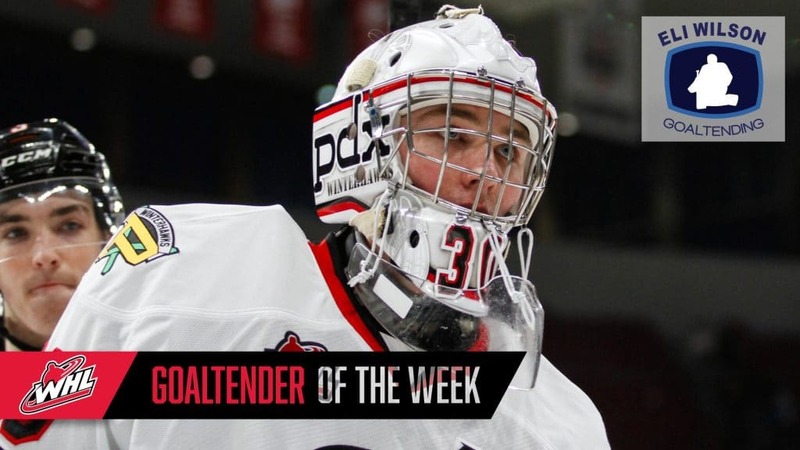 – The Western Hockey League announced today that St. Louis Blues prospect Joel Hofer of the Portland Winterhawks has been named the WHL Eli Wilson Goaltending Goaltender of the Week and league nominee for the Vaughn CHL Goaltender of the Week for the week ending February 17, 2019. In 120 minutes of action, Hofer posted a 2-0-0-0 record, 1.00 goals-against-average, stopped 59 of 61 shots for a 0.967 save percentage, and earned his third shutout this season. Hofer produced back-to-back wins for Portland to help them clinch a spot in the 2019 WHL Playoffs. Saturday, Hofer stopped all 25 shots sent his way in a 2-0 shutout of the Red Deer Rebels. Hofer stopped seven shots in the first, 12 in the second, and six in the third for the fourth shutout of his WHL career. Hofer was named the first star of the game and the third star of the night for his performance. Sunday, Hofer stopped 34 of 36 shots in a 5-2 win against the Seattle Thunderbirds, allowing the Winterhawks to extend their run of consecutive appearances in the WHL Playoffs to a tenth season. Hofer stopped 11 shots in the first, 13 in the second, and 10 in the third for the victory while the Thunderbirds went one-for-two on the power play. The 6-foot-3, 157-pound Hofer has excelled in 11 games with the Winterhawks. Acquired in early January by the U.S. Division club, Hofer has posted 7-4-0-0 record, 2.76 GAA, 0.920 SV%, and two shutouts with his new club. In 41 games this season with the Winterhawks and Swift Current Broncos, Hofer has a 13-25-2-1 record, 3.67 GAA, 0.907 SV%, and three shutouts. For his WHL career, the 18-year-old product of Winnipeg, Man. has appeared in 60 WHL Playoff games, posting a 21-28-3-2 record, 3.40 GAA, 0.909 SV%, and four shutouts. The Winterhawks are back in action Monday, February 18 (3:00 p.m. PT), taking on the Vancouver Giants at the Langley Events Centre. 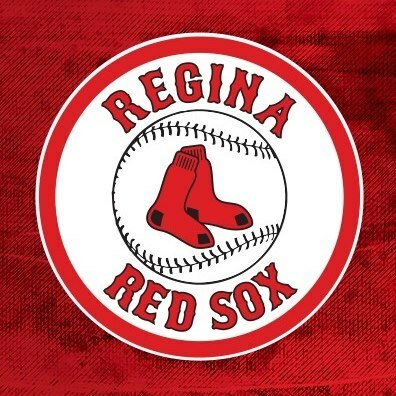 The Regina Red Sox are looking for a local assistant coach for the upcoming WCBL season. This entry level coaching position is an excellent opportunity to work and learn from head coach Jason Veyna and general manager Bernie Eiswirth. • 2017: Philadelphia Phillies hitting coach. 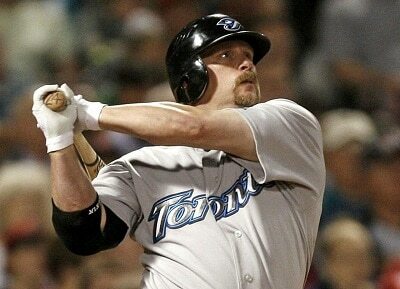 • Inducted into the New Brunswick Sports Hall of Fame in June 2012. The Weyburn Beavers are excited to announce Beau Rabedeaux as the Assistant Coach for the 2019 Season. 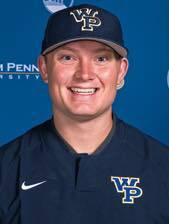 Rabedeaux is in his first year as a graduate assistant baseball coach at William Penn University in Oskaloosa, Iowa. Rabedeaux is a 2018 graduate from the University of Jamestown with a degree in health and fitness administration. A four-time letterwinner at UJ, Rabedeaux helped lead the Jimmies to national tournament appearances in 2016, 2017, and 2018. During his tenure at Jamestown, Rabedeaux broke into the top-10 list for single-season wins in 2016 and also sits third on the all-time appearances list with 64. Rabedeaux is a Seattle, Wash. native and is is currently working on his Master’s of Business Leadership degree at William Penn. Rabedeaux was a RHP for the Beavers in 2017.